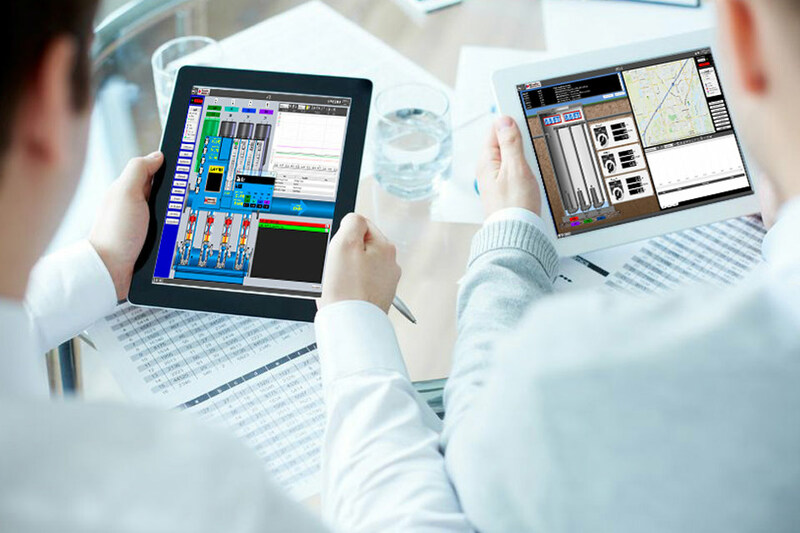 How nice would it be if you could look at your SCADA screen whether you’re on-site or not? With cloud-based SCADA systems, you can. Maybe you’ve heard of cloud SCADA, or “the cloud” in general and you have your suspicions. We’re here to put those reservations to rest and let you know how a cloud-based SCADA system can change the way you monitor, control, and/or archive your water and wastewater systems. Starting off with the basics, what exactly is SCADA? SCADA stands for Supervisory Control and Data Acquisition. SCADA systems can monitor and/or control operations at your facility remotely by sending coded signals from a control center to your machinery. SCADA previously consisted of on-site servers and hardware that required a long set-up process and maintenance. Data loss was at a high risk because if the SCADA computer crashed, the data was gone. Additionally, the software had to be constantly updated and annual software costs added up quickly. All these factors caused old SCADA systems to be extremely expensive. In comes new SCADA that uses modern-day technology to solve these issues of the past. Cloud SCADA is operated over a cloud, eliminating physical infrastructure. Cloud SCADA has a faster set-up time, both upfront and on-going costs are significantly less, and is a far more flexible resource. But is the cloud secure? Many people get nervous when they hear the term “the cloud” due to the subconscious imagery that your information is simply floating in the abyss somewhere. The cloud simply means that the information is stored on servers at a remote location. With the cloud, your information has a private IP address, meaning that only you can access it. Your access into that network is through a VPN (Virtual Private Network) tunnel. No interception is possible because the cloud communicates through a very secure protocol. This is the equivalent of trying to access someone’s residential mailbox outside their house versus trying to enter a gated community. This is more secure than storing your information at one on-site location. But what if the server crashes? The cloud always has a primary server, and a backup server, so your information is never at risk of getting lost. The information can also be backed up in different locations to make for an easy recovery. This also means that if one server fails, the system will automatically be online with the new server. What does this mean for the water/wastewater industry? With water pumps, you never know when something could go haywire. It’s hard to tell unless you can consistently monitor your pumps. With cloud SCADA, not only can you monitor your pumps, but also have the option to control them just as you would be able to on-site, but with a more secure way to store your information. Since the cloud allows you to access your screens from a smart phone, smart device, or computer from anywhere, you’ll always be up-to-date on what your system may be doing. But what is your best cloud SCADA option to monitor and control your facility’s pumps? If you are not familiar, Metropolitan Industries has its own cloud SCADA system called MetroCloud SCADA. Our system has every perk of cloud SCADA that we described, in addition to utilizing Amazon Web Services and Verizon as partners. MetroCloud can link to any of our control panels, and is versatile to work for any type of PLC system. For reporting purposes, the MetroCloud can generate spreadsheets to be printed or emailed, and can hold onto your data longer, so you have access to comparison data from as far back as your installation. MetroCloud eliminates dedicated SCADA computer costs, software capital outlay, and yearly software upgrades, and comes with Metropolitan’s promise to be your one stop shop for water and wastewater solutions, making MetroCloud SCADA the most cost-effective, simple, and safe monitoring and control option for your facility. To learn more about MetroCloud SCADA or to let us know about your project, visit metrocloud.us, call 877-89MTCLOUD, or email hello@metrocloud.us.